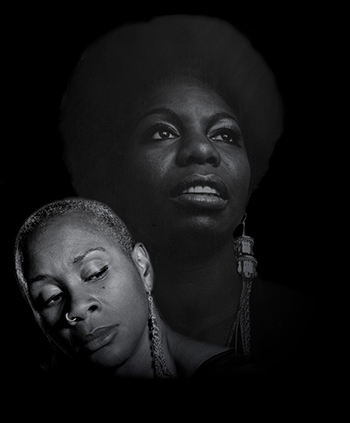 Rather than solely focusing on musical talent, Josette Bushell-Mingo exposes the injustices that Nina Simone faced as a black female during the Civil Rights Movement in the USA. Drawing some powerful comparisons between herself and the artist, what we are given is more than a music recital. The performance started promisingly when Bushell-Mingo set the scene in Harlem 1969, with “hundreds of thousands of afro combs” and people “frying chicken on the street in 38 degrees”. The Olivier Nominated actress gained the support of the audience, encouraging them to whistle and clap and join in the rally, when she aptly sung “Revolution”. However, the song was called to a halt, bringing us back to the harsh reality of the present day, where little progress in equality has been made. When asked in an interview what inspired her to create the play, Bushell-Mingo said that she had “f**king had enough” and this came through. Unforgivingly stopping the “concert”, she reminded the audience of the repeated murders of black victims such as; Emmett Till, Stephen Lawrence, Martin Luther King and more. Stamping each gun shot, the actress forced the audience to focus on these injustices. Although unnerving, the actress asked us to “stay in the blackness” while she explored these feelings and this was powerful. By combining the victims of the past and present, the actress made a clear point that we have not yet had a revolution, a point that I hoped would be carried through to the end of the play. Bushell-Mingo kept the piece relevant when she fixated on the movement #blacklivesmatter, considering how detrimental it is that we need to be reminded that black lives do indeed matter, again reinforcing racial inequality. Bringing the piece back to Simone, Bushell-Mingo focused on the artist’s musical talent where she brought together boring Bach with exciting Jazz. This was a particularly strong point in the play as I felt it informed the audience of how gifted the musician was, while showcasing her talented band (name) and (name). Layering classical and jazz, and majestically dancing between them, Bushell-Mingo, staying true to herself created a silhouette on the screen behind her, with the legend there in spirit. The actresses shadow was replaced with video footage of Simone, ending with a recording of her saying “If she could she would shoot them all”. Bushell-Mingo ruminated on these words, and as if in conversation with Simone, and agreed that she too would “shoot them all”. This created a great deal of discomfort in the largely white audience, and although I am mixed raced, also felt vulnerable in a position akin to the stories of black shootings the actress had previously recalled. Although unnerving, the actress asked us to “stay in the blackness” while she explored these feelings and this was powerful. “Stay in the blackness” was a line that recurred throughout the play. The piece however, lost this precious tension, settling with a cheerful concert where some of Nina Simone’s greatest hits were performed. While these renditions were sung brilliantly with flair, for me, they did not “stay in the blackness”. Instead, the accumulated thoughts on civil rights and real revolution were almost bypassed and the audience able to sit comfortably again. With some revising of overall structure and repositioning of the final songs, this piece has the potential to leave a lasting impression on its audience. A play that started bravely, in its freedom of having “no fear”, ended a little too merrily.